With my last visits to 2 Pennsylvania orthopedic surgeons and still not finding an orthopedic surgeon to solve my problems, my husband suggested I look for someone closer to home. I searched the internet for surgeons who did PAO's. A PAO or peri-acetabular osteotomy is when they cut the pelvis and shift it into a better position to support the joint. They use screws to keep the bone in place. This is a common way to fix dysplasia. You can click on the graphics below to be transferred to a website on hip preservation surgery. Any surgery to fix the hips before total replacements is called a hip preservation surgery. Surgeons would like to preserve as much of the real hip as possible before you need the last surgery of a Total Hip Replacement (THR). Screws hold the bone in place. Some doctors leave screws while others remove them. The hip is now back to 'normal'. Recovery is a long time and this surgery is extremely difficult on your body. It's October and found a specialist in Beachwood, Ohio who was working with the University Hospital. We went for an appointment and were pleased at his beside manner. He explained that although my hips were bad, he could help me. He had done PAOs before. 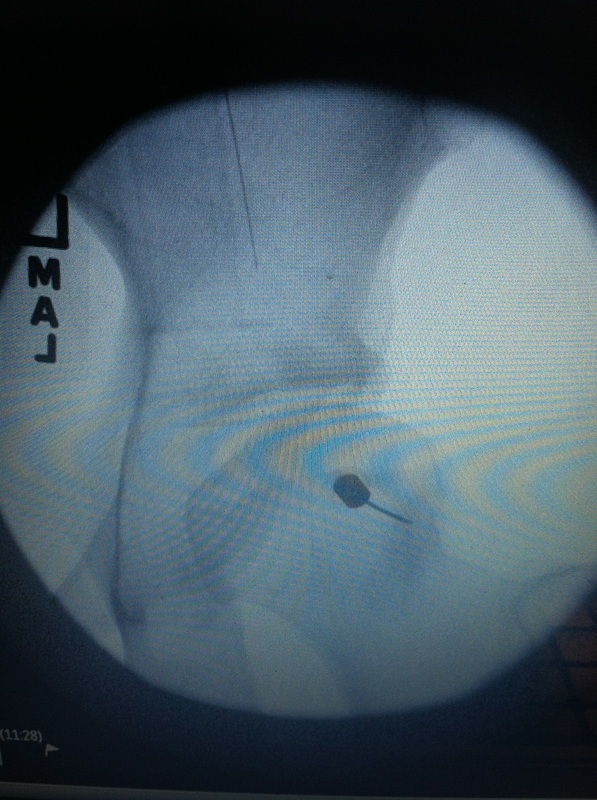 He thought I had acetabular retroversion as well and wanted me to get an MRA or MR-arthrogram. This is where they inject the contrast dye directly into the joint. Sounds like fun right? I went to get this done in October. Little did I know what I was in for, so let me just give you a visual. You are laying down on the hospital bed with your pants down so your hip joints are available. Different doctors and nurses come in and there is a large TV screen on the wall. You notice that your hips are on that screen in x-ray format. They inject you with numbing stuff that does hurt a little. You think that is the last thing you need to actually feel. HOWEVER...you feel as they inject dye into your joints between the ball and socket. I'm talking like someone taking a finger and placing it in between your joints to push them apart. Sounds painful? Yeah, now mulitply that by 10. They had to work the needle back and forth to get the position they want. All the while, I can watch the black dye slowing load up into my joints on the screen. I started to cry. Who knew how much a crier I was until this! When you think it's over, they need to do the OTHER hip! The same thing twice! The doctor who was injected me had to tell me to lay still. How can you lay still when a thick needle is being inserted in between your joints?? Holy hell, this is bad! On the screen, there are 2 perfectly sized circles on my joints. The dye is now there, so I must get to the MRI machine quickly. They wheel me over there in a wheel chair and I never thought I would be so happy to see the tube. I finally get to relax! I lay in the tube and her the loud noises and try to fall asleep. The results come as we drive back over to the hospital where the doctor is. I do have bilateral acetabular retroversion and FAI (femoro-acetabular impingement) cam version. Also, I have anterior/superior labral tears, but luckily no avascular necrosis (dead bone). There is little cartilage left in both hips. This occurs when the ball does not have its full range of motion within the socket. Femoroacetabular impingement (FAI) is a result of excess bone that has formed around the head and/or neck of the femur, otherwise known as “cam”-type impingement. Femoroacetabular impingement also commonly occurs due to overgrowth of the acetabular (socket) rim, otherwise known as “pincer”-type impingement, or when the socket is angled in such a way that abnormal impact occurs between the femur and the rim of the acetabulum. This is the most painful of all 3 of my abnormalities. The extra bone on the neck of the femur was 'catching' on the socket. This accounted for my stabbing pains that literally stopped me dead in my tracks. The alignment of the sockets do not face the normal anterolateral direction, but inclines more posterolaterally. To recap, I have: bilateral hip dysplasia, FAI, and acetabular retroversion. Plus arthritis, degenerative joint disease and cysts within the joints that are ossifying (turning to bone). And ovarian cysts! FAB-U-LOUS! Just freaking fabulous! Here's the best (I mean worst) part: this O.S. doesn't think a PAO would help me! I have more than just dysplasia because the FAI and retroversion complicate things. He has only done 12 PAO's also, which makes me nervous. To quote him "You will be on narcotics until you're 40 unless you get this fixed." What??? I decide to just let things go...for now. I need a break from tests and injections. Besides, I do have those ovarian cysts to worry about now.